In the Climate Change unit, we take a look at how certain gases, the most important of which are carbon dioxide and water vapour, enable the atmosphere to retain heat. Without these gases in the atmosphere, the Earth's temperature would be too low to support life. We will also look at how the warming effect of these gases known as the greenhouse effect caused in a similar way to the warming of a greenhouse. Concentrations of gases in the atmosphere affect climates experienced at the Earth’s surface. 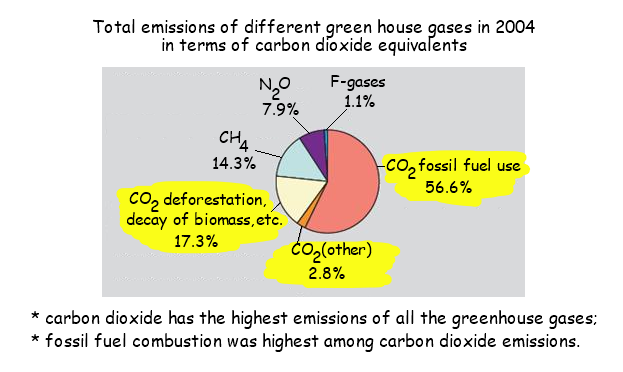 4.4.U 1 Carbon dioxide and water vapour are the most significant greenhouse gases. U 4.4.U2 ​Other gases including methane and nitrogen oxides have less impact. Methane has the third greatest impact on the greenhouse effect. It is emitted from marches, other water-logged habitats and from landfill sites containing organic wastes. Nitrous oxide, which is another significant greenhouse gas is released naturally by bacteria in some habitats and also by agriculture and vehicle exhaust. 4.4.U3 ​The impact of a gas depends on its ability to absorb long wave radiation as well as on its concentration in the atmosphere. State how long water, methane and CO2 remain in the atmosphere, on average. Each greenhouse gas (GHG) has different effects on warming the Earth. It will depend on the GHG's ability to absorb enerty, and how long it remains in the atmosphere. Global Warming Potential (GWP) is been developed to make comparisons of the global warming impacts of different GHGs. When light (shorter wavelengths) enters the earth’s atmosphere, some of the light reflects off the earth’s surface back towards outer space. Greenhouse gases such CO2 and water vapor absorb this heat (infrared radiation) trapping it within the atmosphere, further warming the earth. As the infrared radiation is reflected back off the earth, a large percentage of this heat is captured by the greenhouse gases in the atmosphere. This energy is re-emitted, thus heating up the earth’s atmosphere. This effect is called global warming. The ability of the earth’s surface to reflect light is called the albedo effect. Light colored and white objects such as snow and ice, have a high albedo and therefore little light is absorbed and less heat is produced. Black and dark colored objects like asphalt and pavement have a low albedo, and therefore absorb more light and produce more heat. 4.4.U6 ​Global temperatures and climate patterns are influenced by concentrations of greenhouse gases. Climate refers to the patterns of temperature and precipitation that occur over long periods of time. Climate changes over thousands or millions of years. Climatologists and palaeoclimatologists collect and study data about atmospheric conditions in recent decades and from the distant past in order to infer what the climate was like thousands to millions of years ago. How will projected greenhouse gas concentrations affect temperatures? 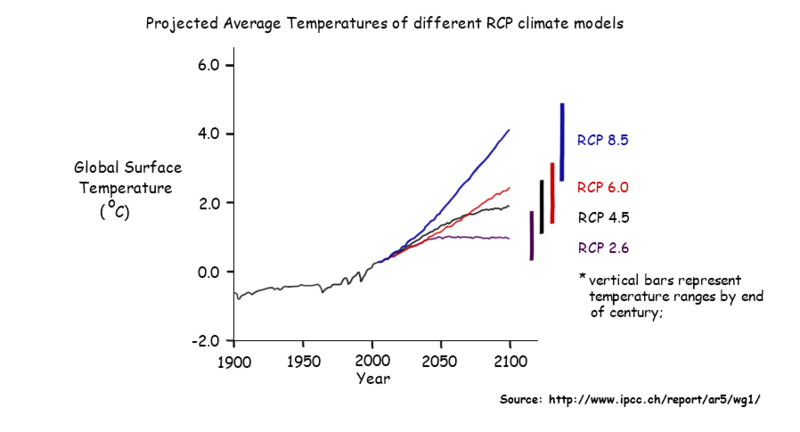 Larger temperature increases projected to be greater than the global average in some parts of the world. How will projected greenhouse gas concentrations affect climate patterns? ​4.4.U8 Recent increases in atmospheric carbon dioxide are largely due to increases in the combustion of fossilized organic matter. As described above, since the industrial revolution the amount of CO2 has drastically increased, largely due to the increasing quantities of combustion of fossilized organic matter (coal, oil and natural gas). The number one source of carbon emissions due to human activities is through combustion of fossil fuels in automobiles, buses and planes. 4.4.S1 Threats to coral reefs from increasing concentrations of dissolved carbon dioxide. Ocean acidification is the ongoing decrease in the pH of the Earth's oceans, caused by the uptake of carbon dioxide from the earth’s atmosphere. Over 500 billion tons of CO2 released by humans since the start of the industrial revolution have been dissolved in the oceans. pH of surface layers of the earth’s oceans in the late 18th century ≈ 8.1179 currently ≈ 8.069, which represents about a 30% acidification. Reef-building corals that use calcium carbonate in their exoskeletons need to absorb carbonate ions from seawater. If the carbonate ions concentrations drop it is more difficult for reef-building corals to absorb these ions to make their exoskeletons. Also, if seawater ceases to be a saturated solution of carbonate ions, existing calcium carbonate tends to dissolve, so existing exoskeletons of reef-building corals are threatened. Volcanic vents in the Gulf of Naples have been releasing carbon dioxide into the water for thousands of years, reducing the pH of the seawater. In this area of acidified water there are no corals, sea urchins or other animals that make their exoskeletons from calcium carbonate. In their place other organisms like invasive algae and sea grasses flourish. Unfortunately this could be the disheartening future for coral reefs around the world if carbon dioxide emissions continue to rise… Loss of tropical coral reefs to acidification could cost $1 trillion by 2100 in terms of lost shoreline protection and lost revenues for the tourism and food industries. 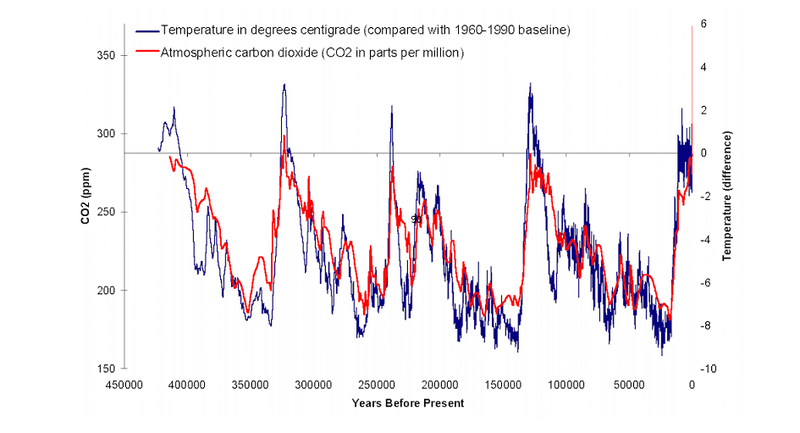 4.4.S2 ​Correlations between global temperatures and carbon dioxide concentrations on Earth. ​Do you see any evidence in graph that humans are not causing climate change? ​Hence, the past half-million years provides absolutely no evidence ongoing rise in the CO2 levels will lead to significant global warming/climate change. The precautionary principle is meant to guide decision-making in conditions where a lack of certainty exists. Is certainty ever possible in the natural sciences? ​In this TED Global 2010 talk, Lee Hotz describes the work of researchers in the Antarctic, studying the history of our planet’s climate, through drilling ice-cores that go back in thousands of years. ​In which Hank details the five scariest things that will likely happen because of climate change. NOAA's Mauna Loa Observatory on the Big Island of Hawaii,is a leading atmospheric research facility. The observatory has been collecting and monitoring data relating to atmospheric change since the 1950s. Dr John Barnes, the Station Chief for the observatory, describes the functions of the MLO, which provides valuable long-term and continuous recording of data.